I have been enjoying so much all the Halloween treats you crafty people are making for your parties coming up. So, I thought I would share a few of them that caught my fancy. I hope you enjoy. 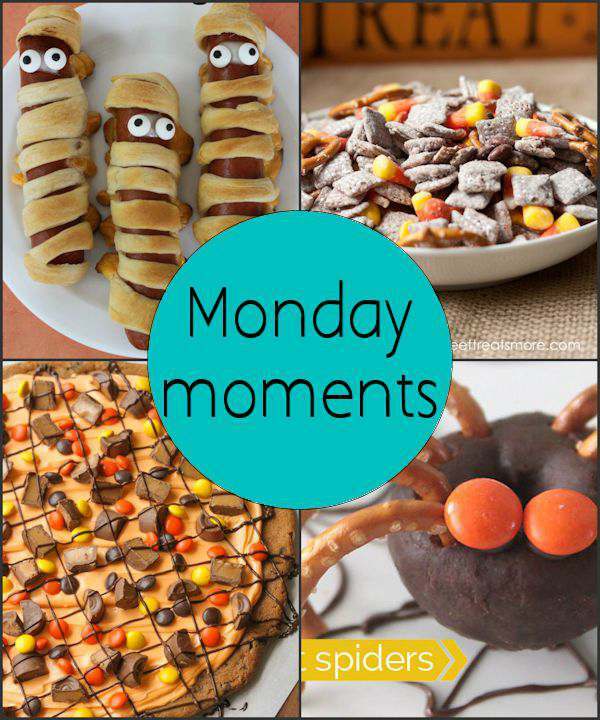 How about using the classic crescent roll and hot dogs to make Halloween Mummy Hot Dogs. The recipe is really easy to follow and Frugal Living shows you easy step by step instructions with pictures. I had to find some recipe with Candy Corn in it. My favorite Halloween Candy. Pure sugar rush!! Halloween Muddy Buddy Mix has all the joys of Halloween in one mix. Another pretty easy recipe to make and have on hand for those spooky parties or give out as treat bags on Halloween night. Sweet Treats & More has all the instructions for you to follow on her blog. It ain’t a party with out some kind of pizza! The yummy looking delicious of a pizza is called a Halloween Cookie Cake. What a great way to end a kids party then with this special treat from Lil’ Luna All Things Good. And what about a few spiders crawling around on your party table. These Easy Mini Donut Spiders tell it all in the spider. Easy is always good and you can read all about this recipe at Its Always Autumn.